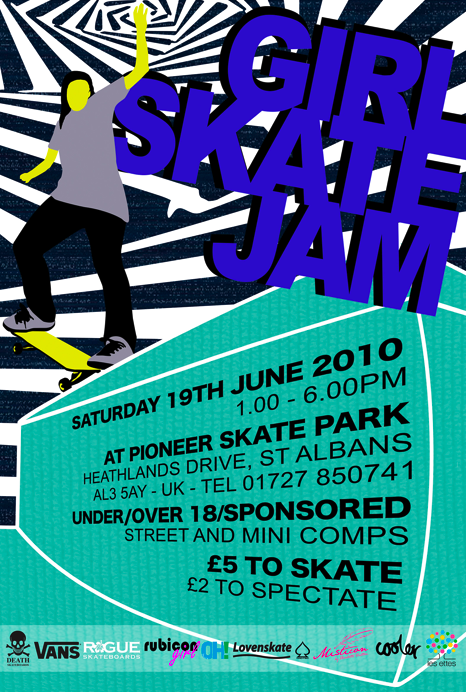 The 9th annual competition and jam with take place on Saturday 19th June, at Pioneer Skate Park in St Albans. It will run between 1-6pm with BBQ and free skate for all afterwards. There will be a jam between 1-3pm with competitions for under and over 18 / sponsored / mini from 3pm. This years event will see riders from Australia, Spain, France, Belgium as well as girls from the UK competing. Les Ettes’ Carmela Fleury and Lovenskate’s Alex Barton will act as judges, resident Pioneer MC Joff Talbot will also be doing the honours. Many thanks to all the sponsors for supporting the event: Death, Vans, Rogue, Rubicon, OH! Beanie, Lovenskate, Pro Tec, Misticon, Cooler Magazine and Les Ettes. Check out last years edit! Yes Jenna’s given me long hair! Thanks mate!